Farley Pavers was the first ever company in North America to purchase Optimas T-11 Paver installation machine, utilized for precision, mechanical installation of interlocking concrete paver streets and parking lots. This advanced piece of machinery delivers an unmatched level of efficiency and quality in segmental unit installation. 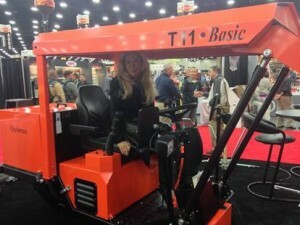 Charissa Farley of Farley Pavers purchased the first ever Optimas T-11 Paver installation machine in North America. The Farley Pavers crew expertly lays driveways, patios, and other smaller concrete segmental unit projects with precision. For larger projects, we use the powerful Optimas T-11 mechanical paver machine to increase efficiency and reduce project costs. The Optimas T-11 paving machine that Charissa Farley recently acquired for the company can install 5,000-6,000 square feet per day! Our machine-installed paving process produces beautiful, precision, permeable surfaces that meet post-construction ‘Best Management Practices’ (BMPs) including U.S. Environmental Protection Agency storm water performance criteria and state and local storm water drainage design mandates. Contact us at 877-553-8797 to learn more about how Southern California’s most trusted interlocking paver contractor can help bring your vision to life.